Lapford Cross MOT & Service Centre is an independent garage and we offer various levels of car servicing. We serve customers all over the Lapford and Mid Devon areas including Chumleigh, Winkleigh and Copplestone. 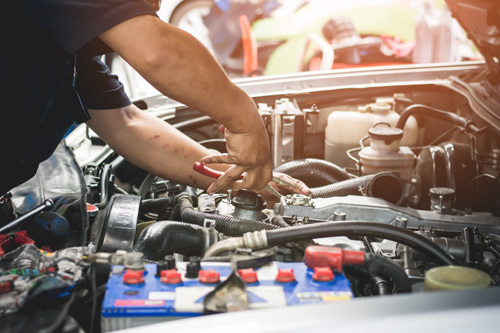 We have a team of fully qualified and knowledgeable mechanics, therefore you can be assured that your car is receiving the attention it deserves. Regular vehicle servicing is an important aspect of car maintenance. In fact, a service will improve the overall condition and performance of your car. Furthermore, regular servicing will identify potential issues with your car that can be addressed before they deteriorate further and become more expensive to fix. We offer a range of vehicle servicing packages for all makes and models. In addition, we have state of the art garage facilities, including engine diagnostic equipment. Therefore, your vehicle will receive high quality servicing at a competitive price. Our car servicing packages offer different levels of servicing, depending on the type of service you require. Recommended between full and major services to keep your car in top condition. Our interim service includes a 40 point check to covering basic aspects of engine relating to the engine, basic checks to the drive system, system, steering and suspension, electrics, brakes, exhaust, tyres and wheels, wipers, washers and lubrication of hinges. Recommended every 12 months. Our full service includes a 69 point check of the vehicle. The checks cover most aspects relating to the engine, drive system, fuel system, steering and suspension, electrics, brakes, exhaust, tyres and wheels, windows, mirrors, wipers, registration plate, lubricating of hinges and a full internal inspection. Recommended every 2 years. Our major service includes a fully comprehensive 71 point check of the vehicle. A major service is the highest level of servicing we offer. Our major service is excellent value for money while being the same quality of a main dealer. For more information about car servicing or to book your car in, please call us on 01363 83373. We also offer MOTs, affordable car diagnostics, car air conditioning servicing, tyre supply and fitting, exhaust repairs and brake repairs and replacements.